Looks like cloud gaming provider G-cluster will finally challenge OnLive in the US cloud gaming arena in the coming year. G-cluster, a fully-featured white label cloud gaming service offering large deployments at scale and a large deployed catalog of casual and AAA games, will debut its Game Machine cloud gaming platform at CES 2013 allowing operators to bring premium and casual games to the TV without the need for a gaming console. The 2013 International CES (Consumer Electronics Show) will be taking place in Las Vegas, Nevada on January 8-11 with IPTV and wireless operators and game publishers invited to check out G-cluster's cloud gaming offerings from TV to mobile to the ultimate cloud gaming machine. The G-cluster Game Machine plugs into the HDMI port on HDMI-equipped televisions and connects to the home Wi-Fi network to access the service. Gamers can use a gamepad with a wireless receiver, or smartphones or tablets, to control gameplay on their TVs, playing alone or with friends using other devices such as personal computers, tablets, or smartphones. 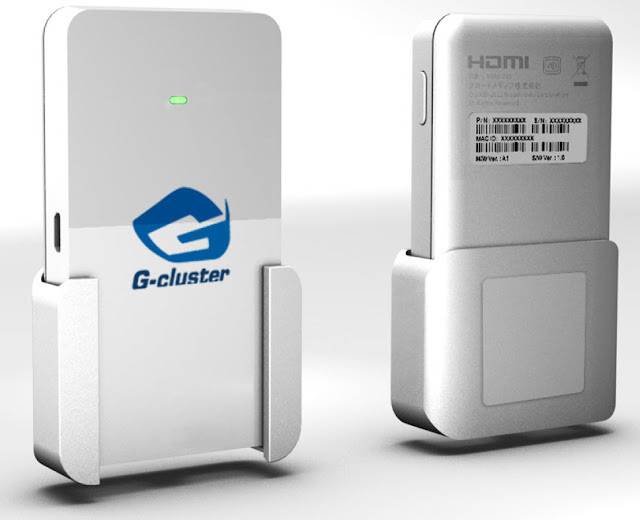 The G-cluster Game Machine is most likely very similar to the G-cluster Wi-Fi cloud gaming console which will be deployed by G-cluster for Japanese Broadmedia Corporation in Spring 2013. “With G-cluster’s cloud gaming platform, operators can achieve high margin service revenue growth with marginal setup, maintenance, and operational effort commitments,” said Taro Hashimoto, Chairman and CEO of G-cluster Global. “The tiny game machine turns your TV into a massive cloud gaming experience. Smartphones and tablets are default controllers of the game machine. It will be a natural and exciting extension of your smartphone and tablet experience,” he added. Already a North American Tier One operator is trialing the G-cluster cloud gaming service, but with this announcement G-cluster is already late to the party. Back in September a report surfaced that the big US telecom carriers including AT&T, Verizon and Time Warner Cable are working on their own cloud gaming services. That report has already been confirmed by the launch of the Ubitus GameNow cloud gaming service for Verizon Wireless 4G LTE customers and Playcast's announced entry into the US cloud gaming market for Q1 2013. To date more than eight million gamers worldwide have access to G-cluster's multi-platform cloud gaming experience through IPTV set-top boxes and personal computers, and in the near future will have on smart connected TV’s, mobile devices, and now the G-cluster Game Machine. Founded in 2000, the Tokyo, Japan based G-cluster was the first cloud gaming platform to be operational on a large scale worldwide and is currently one of the largest cloud gaming platforms worldwide. G-cluster is already well-established in France as they have launched cloud gaming services for customers of the French telecom carriers Orange and SFR, they have also partnered with France-based games publisher Ubisoft and more recently with Disney. G-cluster invites CES attendees to come play at CES 2013 in the G-cluster MGM Signature Suite. Media are invited to attend an event in the suite on Wednesday, January 9 at 4:30 p.m.